Last spring, the Midland State Police Department charged a businessman and a local gambling commissioner with entering into a bribe in order to procure the commissioner’s support for a casino license. The accused men acknowledge that money changed hands – but they called it police entrapment, not bribery. The resulting court case, State v. Bancroft/ Covington, takes many twists and turns as witnesses and evidence surface. It is both believable and entirely fictitious. 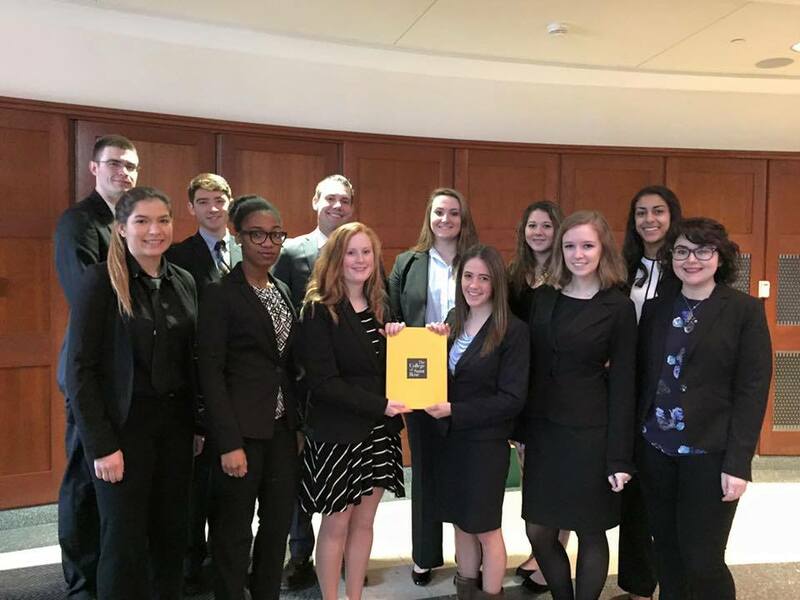 At the American Mock Trial Association’s regional tournament February 20-21, the College of Saint Rose Mock Trial Team argued State v. Bancroft/Covington four times – twice for the prosecution and twice for the defense – earning an “Honorable Mention” and a chance to possibly advance to the next level. Held at Yale University, the tournament pitted 30 college and university teams against one another. Saint Rose emerged with a 5-3 record, defeating Amherst College and the University of Massachusetts at Amherst and tying the University of New Hampshire. Saint Rose lost only to host and eventual winner Yale, which was undefeated. The Saint Rose team’s finish put it in the same competitive bracket as teams from Brown University, Wesleyan University and other elite institutions. This year, in fact, Saint Rose is seeing its best results since starting four years ago. In regional invitational tournaments last fall, the College faced dozens of teams from as far away as Texas and placed fifth in two of the events. In addition, individual team members have won performance awards for convincingly portraying figures in the cases: Ashley Arcuri and Eamon Murphy each won as witnesses and Kyle Duclos as an attorney. 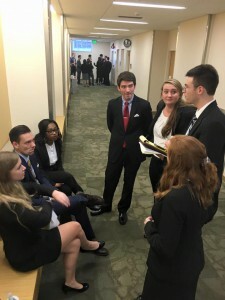 The 12-member squad had studied State v. Bancroft/Covington since the summer, along with mock trial teams from more than 200 other colleges and universities. College teams play the role of prosecutors and defense attorneys, witnesses, police and, of course, the accused, all before judges. To shine, competitors not only need to have an encyclopedic knowledge of the case, court procedures and the rules of evidence, but also the ability to look and act the part of whomever they might play. And, just like real cases, competitors need to adapt to changes in procedure with almost no lead time – and be equally conversant in the prosecution and defense cases. The ‘Honorable Mention’ showing at the competition held at Yale qualifies Saint Rose to participate in the opening round of the Championship Series Tournament held in Wilmington, Delaware, on March 19 if other qualifying teams cannot participate.